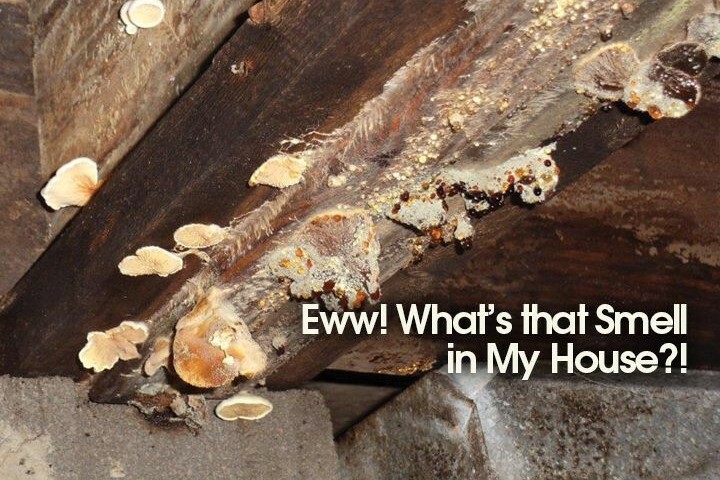 ArticlesArticlesWood Rot in Crawl Spaces: What’s That Smell in My House? Wood rot in crawl spaces can result if the area is damp and unventilated. If wood rot has occurred, it will require repair. A common source of wood rot for floor structures is a damp, ventilated crawl space. Building Codes have long required that a crawl space should have foundation vents within three feet of each major building corner and every ten feet between these corners. An intact, plastic vapor barrier should cover the ground beneath the house. Water can seep under or through the foundation walls into the crawl space. So, adequate drainage around the outside of these walls is very important to keep the ground from becoming saturated. Another source of moisture can be an air conditioning condensate drainage pipe that incorrectly drains water into the crawl space. It should be made to drain outside the home. Water in the crawl space can promote the growth of mold, mildew, and fungi that actually eats and weakens the wood of the floor substructure. Wood is a hygroscopic material so it readily absorbs water vapor. Wood absorbs water slowly, and it can take a considerable amount of time before dry wood can absorb enough moisture to be in danger of decay. A particularly dangerous source of water in the crawl space is any kind of hot water leak. Steam seems to promote rapid bacterial and fungal growth. Mold and mildew belong to a large botanical classification known as fungi. Mildew is a black fungus that grows on the surface of wood and darkens it over time. Although it doesn’t cause damage, it is a tale-tell sign of a high moisture condition. Mold and mildew often grow on surfaces when the relative humidity (RH) near the surface is above 50 per cent. Decay organisms are also fungi, but they typically take longer to get started than mold or mildew. Decay fungi can attack wood and other materials when the moisture content(m.c.) is above 20 percent. The percentage of RH is different from the percentage of m.c. In most homes the m.c of the building material is considerably less then the RH of the air surrounding it. The m.c. of wood is expressed as a percentage of the wood’s oven-dried weight. A living tree contains a certain amount of water. For example, the m.c. of a birch tree might be 75 percent. By the time the lumber from the tree reaches consumers the wood has usually dried to about 19 percent m.c (15 percent for kiln-dried products.) The wood in a home continues to lose moisture over time until it reaches equilibrium with the climate it is in; the m.c. of wood in most homes is typically less than 10 per cent. Decay problems occur when wood remains wet for an extended period. For example, if there is a plumbing leak under a bathtub the floor can be wet for many months. Remember that wood absorbs moisture easily, but slowly. If there is enough moisture present for a long enough period of time, the m.c. of the wood can rise above 20 per cent and decay is a strong possibility. If a leak is temporary, the wood won’t be wet long enough for decay organisms to attack it. The best way to cure a moist/humid crawl space is to close off the foundation vents, cover the ground surface with a seamless vapor barrier, attach the vapor barrier to the perimeter foundation walls and interior piers, then insulate the perimeter foundation walls and heat and cool the crawl space using the home’s central heating and cooling system. When this is not possible, you can place a specialty dehumidifier in the crawl space — one designed for this specific application, and be sure to direct the collected condensate outdoors.